Although the baobab fruit has been used in its countries of origins since ancient times, it is only recently that health-conscious consumers in Europe have become aware of it. Containing a range of nutrients, packing large amounts of vitamin C, magnesium, iron and antioxidants along with other health benefits, the fruit has been touted as the new “superfood”. Large supermarket chains all over Europe now stock baobab on their shelves, signaling that the product is becoming more mainstream. At africrops! 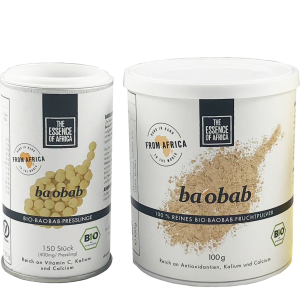 we notice the same development, responding to an ever-increasing demand for baobab, not only as a bulk product but also for our “The Essence of Africa” baobab powder, which is available in major German supermarkets such as Rewe, Edeka and Alnatura. The increased demand for baobab seems to be particularly strong in the UK, where the British food distributor Ocado reported an increase of 27% in weekly sales of baobab products since the beginning of 2018, according to the industry news platform “The Grocer”. Product developers also seem to have discovered baobab as a great ingredient for various products. The British dairy company Yeo Valley now released a limited-edition Baobab-Vanilla yogurt, becoming one of the first major brands to use baobab as a main ingredient. This has created a very positive response among consumers. Thanks to its versatile nature, baobab is used in a wide range of goods such as gin, chocolate, dairy products and even beauty products. 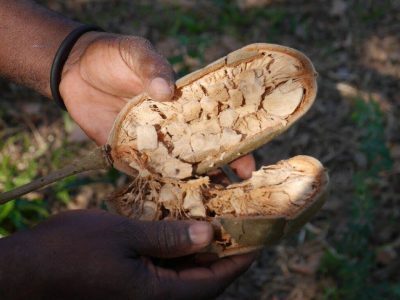 With the demand for baobab growing, so is the concern for sustainable harvesting practices of the fruit. It is therefore important to ensure that the product is traded fairly and that its export does not jeopardize the availability and affordability of the fruit as a resource for the local population. At africrops! we make sure that our partners meet sustainable agricultural criteria and that the farmers receive a fair paycheck for their high-quality product.